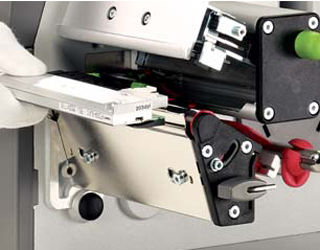 The printhead of the label can be replaced without the need for fine adjustment. The printhead must be replaced if worn or when switching to a printhead with a higher or lower resolution. For better differentiation, the print heads have a label stating the printer type and resolution. Setup printer on a grounded, conductive surface. Ground your body by wearing a grounding wristband. Do not touch contacts on the plug connections. with hard objects or your hands.